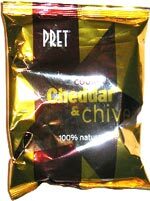 Taste test: These are thick, crunchy, dark kettle-style chips with a generous helping of chives spread all over them, along with a very mild cheddar cheese taste. They leave a lot of powdery residue on your fingers. Taste is about average, but they do win some points for being particularly crunchy. Smell test: It really does smell like cheddar and chives.